For some, healthy eating means sticking to a plant-based, vegetarian diet. Others find a way to eat healthfully while consuming some sources of animal protein. Some follow a restricted diet while others believe it's OK to eat sweets and snacks in moderation. Although healthy eating does have different meanings, there are some similarities among them. The following features can help you know if your family is eating a healthy diet or not. Variety. The USDA's Choose My Plate program describes a healthy eating style as eating a variety of foods from each food group. That includes vegetables, fruits, grains, dairy, oils, and proteins. Amount. How much you and your kids eat is also important. Taking in too many calories every day leads to weight gain, which can negatively affect your family's health. The USDA recommends choosing smaller portion sizes to help reduce the amount you eat. Nutrition. You probably know that some foods are more nutritious than others. But what does that mean? Nutritious foods contain higher amounts of vitamins, fiber, minerals and other nutrients than "junk" food. You'll get more nutrition from a handful of grapes than from a handful of M&Ms, for example. Ingredients. Healthy eating means minimizing or trying to avoid foods that contain lots of saturated fats, added sugars, and salt. Eating those ingredients in limited amounts won't hurt you or your kids, but too much leads to weight gain. Now that you have an understanding of what healthy eating is, take a look at why it matters. Healthy eating offers several benefits for your kids. Start life-long habits early. Think back to things you learned as a kid -- brushing your teeth, taking a shower or bath, putting your clothes in the hamper each night. Those habits are second nature now that you're an adult. The same can be true with healthy eating. The earlier your kids learn about and practice good nutrition, the more likely it will become a life-long habit. Improve school performance. Kids who eat better do better in school. There's a direct connection between children's nutrition and better grades, according to the CDC. Kids who eat healthily are also more likely to go to class and to pay attention in class. Help kids control their weight. Nearly 20 percent of kids are overweight or obese, according to the CDC. Being overweight as a kid puts a person at an increased risk for health problems throughout life. Good nutrition and healthy eating habits can help lower calorie consumption, helping kids lose extra weight or keep it off. Help to improve energy levels. Kids who don't eat right can be sluggish or tired throughout the day. On the flip side, kids who eat a lot of sugar can be overly-active. A balanced diet will give a kid the energy boost they need to pay attention. But it won't give so much energy that they're bouncing off the walls. Reduces risk for health problems. Weight gain isn't the only issue connected to a poor diet. Reducing sugar intake can also improve the health of a child's teeth (fewer cavities). Eating less sugar and controlling a child's weight can reduce diabetes risk too. "But my kid hates vegetables," you might be thinking. Or, "I don't have time to cook healthy meals." Getting your kids to eat nutritious foods and finding the time to prepare healthy meals can be challenging. But neither is impossible. One way to change up your child's eating habits is to limit the amount of "junk" food that comes home. 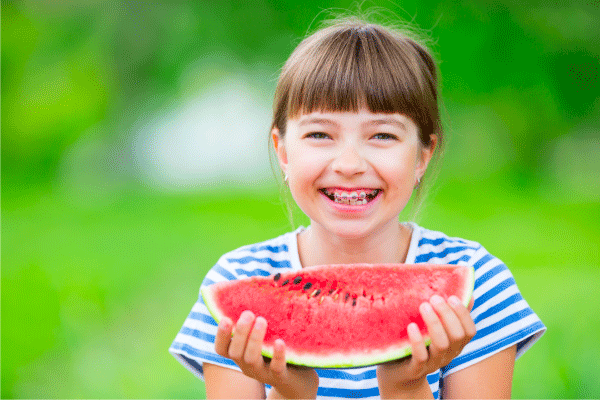 Instead of offering chips and sweets as snacks, give your kids fruit or raw veggies. Dips like ranch dressing or hummus can make fresh vegetables tasty for even the pickiest of kids. Also, not all convenience foods are "unhealthy." You can find pre-cut vegetables in the produce section, which make it super easy to serve produce with a meal. Quick-cooking whole grains also help you boost your family's fiber intake. But they don't take long to prepare. You can also turn healthy eating into a game. For example, encourage your kids to eat at least five servings of fruit or vegetables daily. Each time they eat a fruit or vegetable, put a sticker on a chart. At the end of the week or month, count up the number of stickers and give out a prize. Swap fresh berries for berry flavored fruit snacks. Try natural peanut butter, which doesn't have added oils or sugar. Serve air-popped popcorn instead of pretzels or potato chips. Your family doesn't have to give up sweets and salty snacks entirely. It's just important to teach your kids that those foods are treats, not everyday indulgences. The occasional slice of cake, scoop of ice cream or handful of potato chips won't hurt them. The trick is to figure out what "occasional" means. Once a week or once a month is almost always better than once a day.